The tradition of collecting Sèvres porcelain is as old as the manufactory itself. The French Porcelain Society has many collectors among its members. They may buy pieces of a similar shape, date, ground colour or perhaps the work of a specific painter. Discussing and showing their collection to others who share their enthusiasm is one of the delights of membership. Here are three of the most notable French porcelain collectors from history. 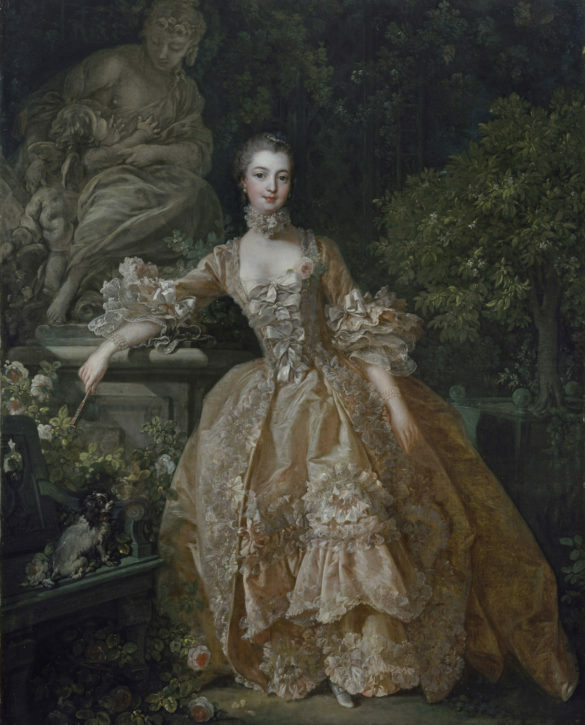 Madame de Pompadour (1721-64) was an influential political advisor and patron of the arts as well as Louis XV’s mistress and friend. This portrait of her by François Boucher (1703-70), dating to 1759, which explores the themes of friendship and fidelity, is on display in the Oval Drawing Room at the Wallace Collection. 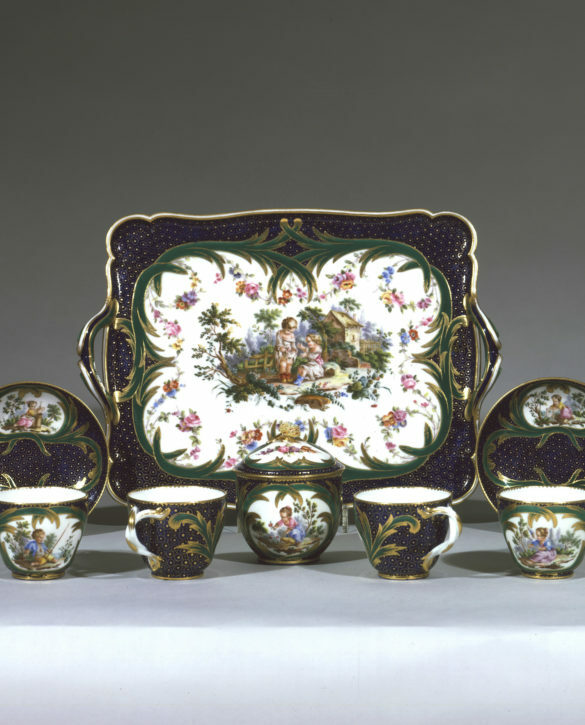 Under Madame de Pompadour’s influence, new designers and painters like Boucher and the modeller Ėtienne Maurice Falconet (1716-91), were encouraged to work for the Sèvres manufactory which began to develop a distinctive range of rich ground colours and specialise in inventive shapes and fine gilding. One of these colours, the pink, was frequently referred to in the eighteenth and nineteenth centuries as ‘rose Pompadour’. Madame de Pompadour was a discriminating collector of silver, Gobelins tapestries, glassware, marquetry furniture, Lyons silk, St Cloud porcelain and, of course, the beautiful new Vincennes and Sèvres porcelain. In 1762 she bought a pair of ‘elephant vases’ – vases ‘a tête d’éléphant’ – like those shown on the opening page of this website, with rose and green ground colours. She is thought to have bought the tea service illustrated here, decorated in green and blue and with paintings by André-Vincent Vielliard of children engaged in rustic pursuits, in December 1759. Her luxuriously furnished apartments at Versailles also included three examples of the distinctive pot-pourri vase in the shape of a masted ship or pot pourri ‘à vaisseau’, tea and dinner services, furniture mounted with Sèvres plaques and vases which incorporated bouquets of delicate porcelain flowers. 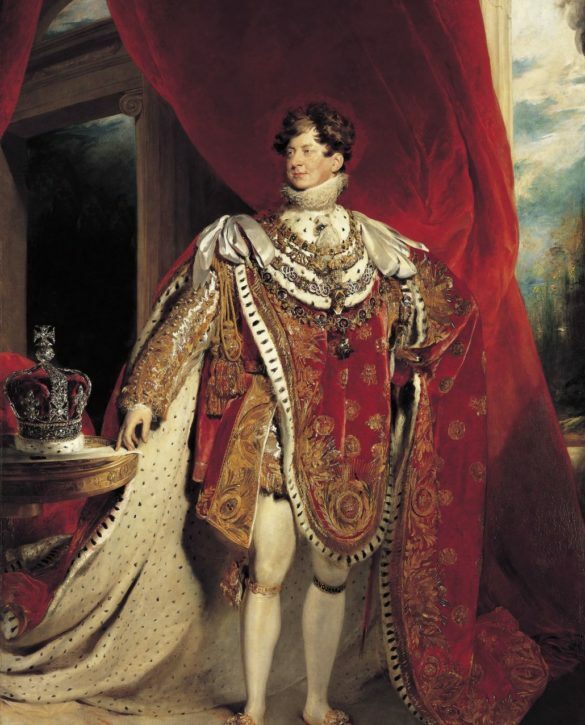 This coronation portrait of George IV (1762-1830) was painted by Thomas Lawrence in 1821. The king rests his hand – and his crown – on a table commissioned by the vanquished French Emperor Napoleon from the Sèvres manufactory in 1806. Known as the ‘Table of the Grand Commanders’, the table top is decorated with painted cameos of commanders and philosophers from history in hard-paste Sèvres porcelain. 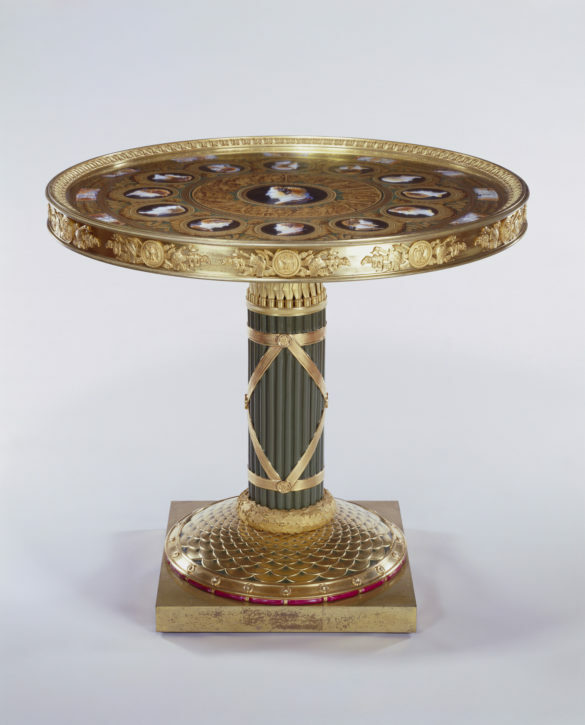 Designed to immortalise Napoleon’s reign, the table is shown here promoting a British king, a gift to George IV from a grateful Louis XVIII in 1817. George IV made his first ever purchase of Sèvres porcelain at the age of 21 and continued to collect it until his death, delighting in sumptuously decorated and gilded ornamental items to decorate his palaces, first at Carlton House and later at Windsor Castle as well as his seaside pavilion at Brighton. The sale of art objects from French royal palaces after the Revolution in 1789 enabled the king to acquire some of the most exceptional pieces of Sèvres porcelain ever made. These included part of the dinner and dessert service commissioned by Louis XVI in 1783 for his personal use at Versailles, painted with a bleu nouveau ground and decorated with scenes from mythology and Greek and Roman history. Much of George IV’s collection can still be admired at Buckingham Palace and Windsor Castle. To find out more see the Royal Collection online. For Carlton House see here. All four generations of the Hertford family are thought to have collected Sèvres porcelain but it was Richard Seymour Conway, the 4th Marquess of Hertford (1800- 70), who formed the most remarkable collection, starting in the 1840s. This was displayed with his collection of equally fine paintings, clocks, French eighteenth-century furniture, sculpture and gold boxes in London at Hertford House (now the Wallace Collection in Manchester Square) and at his homes in Paris, 2 rue Laffitte and the château de Bagatelle. 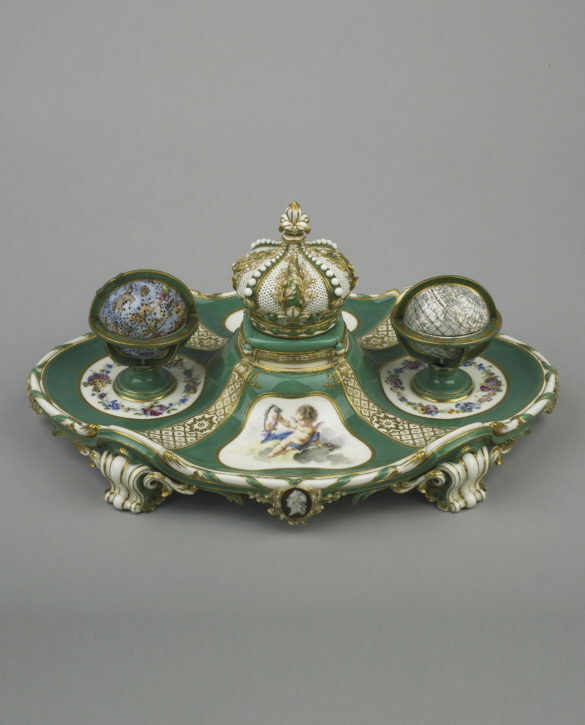 Like George IV, Hertford was particularly attracted by pieces with French royal connections like the inkstand or écritoire ‘à globes’ shown here. Very rare and one of only three examples of this design, it was given by Louis XV to his favourite daughter Madame Adélaïde. Hertford also bought wisely and well, preferring to choose pieces which were ‘in a perfect state & most positively old’. 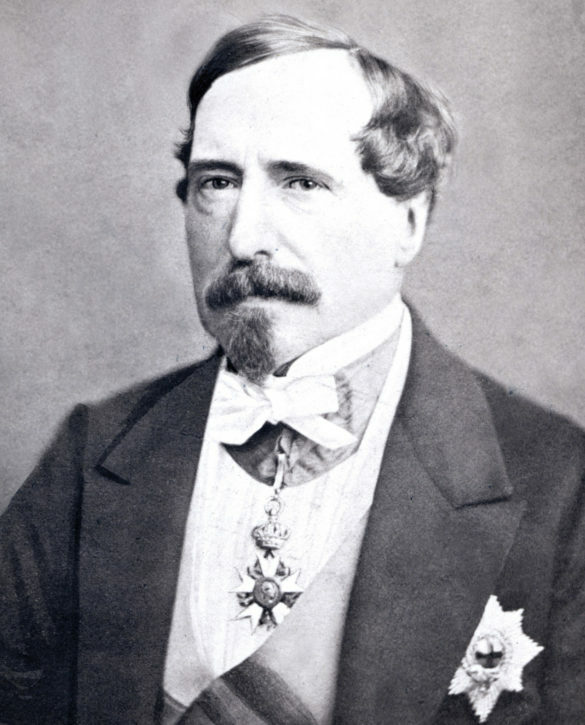 Leading a somewhat reclusive life, largely in Paris, Hertford relied on his agent Samuel Mawson, his illegitimate son Richard Wallace (1818-90) and the leading dealers in London and Paris such as Frederick Davis, Henry Durlacher, John Webb, and Charles Mannheim to buy for him. In 1865 Hertford loaned many of the pieces from his Paris collection to an exhibition at the Musée Rétrospectif. The definitive study of the Sèvres porcelain at the Wallace Collection has been written by the President of the French Porcelain Society, Dame Rosalind Savill, DBE, FBA, FSA. The Wallace Collection Catalogue of Sèvres Porcelain, 3 vols (The Trustees of the Wallace Collection, 1988).